Posted on Sunday, February 24th, 2013 at 1:06 pm. The 2013 TACL Political Internship Program is now accepting applications! 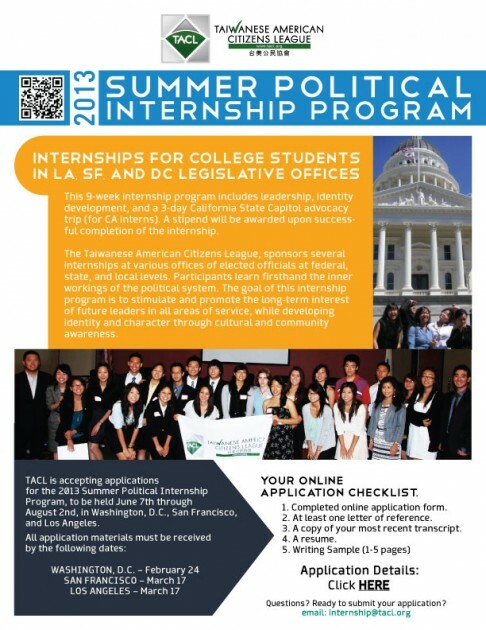 This 9-week summer internship program for college students, held June 7 to August 2, will have positions available in Los Angeles, San Francisco, and Washington, D.C. Interns experience first hand how the political system works and observe and participate in the formation of policies, both domestic and foreign. Political interns will be assigned to offices located in Washington, D.C., San Francisco, and Los Angeles. In addition to working in their offices, interns visit top legislators in an intense lobbying trip, attend community events, participate in leadership development workshops, and various other activities.